Fenland Rods got off to a flying start to their new season with a good turnout and a very good result from the Six Island Pool at Decoy Lakes. Leading the way with a fine 137lb 4oz was Dave Garner. He drew peg 18 and after a slow start caught well on meat throughout the rest of the match. Runner-up was Mac Campbell. He drew peg 25 and was another to catch close in with meat and corn. He weighed in 100lb and was followed by Bill Foster with 92lb. There was a smaller match on Easter Monday on Six Islands and with a few extra pegs to spare the weights recorded showed how good this venue can be, even at this time of year. Leading the way was up and coming Paul Faulkner. He drew hot peg 18 and made no mistake bagging a fine 189lb with most fish falling to his margin lines with sweetcorn and paste. Second was Andy Gausden with 156lb 8oz and third Gus Gausden with 123lb 3oz. 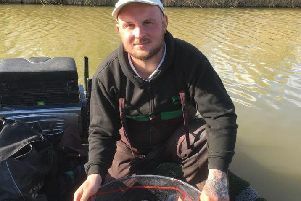 Keith Rounding made it two wins in a row at Haddong Lodge when winning on Sunday with a net of skimmers and a few small carp weighing 19lb 9oz. Fishery bailiff Cliff Fuller came second with 13lb 4oz, followed by Tony Moulds with a level 13lb.